If you've not yet picked up an iPhone X but you're eager to get your hands on Apple's latest and greatest handset, then your best option might be seeing what stock is like at your local Apple Store rather than going through the ordering process on the Apple website. 9to5Mac reports that the phone is widely available for same day in-store pick up at many Apple Stores, at least in the US. The situation might not be the same in your part of the world - and may not last for long - but we'd say it's definitely worth checking. On the official Apple website, shipping times are currently set at 3-4 weeks if you place your order today. That means heading into a store could mean you get your shiny new gadget up to a month earlier, though stock levels are likely to fluctuate pretty regularly. We've heard plenty of speculation about supposed production problems with the iPhone X, and how stock could be in short supply as Apple looks to source enough screens and Face ID detection units to be able keep up with demand. Those rumors started before the device went on sale and haven't stopped since. 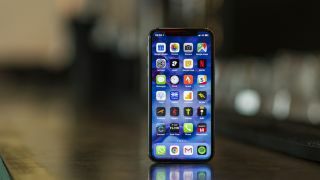 The iPhone X went on sale several weeks after the iPhone 8 and iPhone 8 Plus, and was quickly sold out online. Since then though, some delivery dates have been improving, and it looks like Apple might be over the worst in terms of a squeeze on available units. The fact that many Apple Stores have the phone available to pick up the same day backs up that idea, and the situation should improve through 2018 as Apple irons out any problems in its supply chain. By the time we get around to next year's iPhone, there shouldn't be any problems with getting hold of a premium iPhone.